One of my regular readers here did a post on her about Alexa’s Stamp set! Her samples are adorable. More so than that was the message! Please click —>HERE to read it! Its so sweet. I love also seeing/hearing what other people out there do to use stamping to make a difference! Thanks so much MJ! There are so many people who will be touched by your contribution! Today is the day! You can now order from Lizzie Anne’s NEW! Release sets! There are 8 new set releases, and 16 new simply singles! AND they are all CUTE!!!!!!!! Speaking of ordering-have you seen that All That Scraps has new Primas in? Basic Grey paper, Cats Pajamas, Sassafras Las Owl set and OMW! So much more! I placed my order yesterday so happy mail here I come! OK-sorry you know I cant let you NOT know about cool stuff right? I am going to show you a few samples from some sets I have yet to use! They are all part of the new releases available TODAY! How cute are these snowmen? They are from the simply singles line-as are the snowflakes I stamped on vellum cardstock. WHOreally goes ALL OUT on mass producing holiday cards? NOT “I”! And thats what I’m lovin these days-clean, and simple, yet still detailed. I thought about adding a few brads-but haven’t decided yet…………….its better to add later or keep it clean rather than clutter and over do! This is a small main image and I dont want to detract your focus from that either! 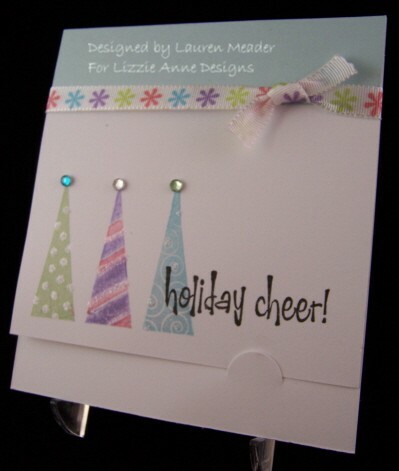 Here is another quickie card, using the new Simply Singles-snowmen, and the set Holiday Cheer. I just punched out the snowmen (see full image above) I wanted with my circle punch, and covered the words with some wavy cut cardstock! Added some stickles and done! Do these colors not scream Holiday Cheer! This is so retro! I love these trees from the Holiday Cheer set! Just colored with my SU! Markers, and I was done. OK I know I HAD to add some stickles and some of those adhesive rhinestones-its a bad habit that I just LOVE to hate. The POP of the sentiment in black is perfect-and I like the funky tab closure. The ribbon in by American Crafts in UPTOWN collection-love these different Christmas/Holiday colors. And that my friends is it for today! Hope you get to order! Id LOVE to hear what is your favorite new Lizzie Anne set! Mine is shockingly High Hellos, and L’Amour. I LOVE the Floral Frenzy but am having a serious block when it comes to ideas-EEEK! Not cool! I’d alos love to hear what you think you will use for your Christmas cards this year! Any ideas? I am clueless! Gotta get the kids photos done first! Before you watch this you need some background info! Jason is the coach of Noah’s team. There are 6 kids. All ages 4-5. it was a very hot day too! This was their very first game, and it was against an older team! They only had 3 practices! I was so proud of the team. Noah LOVES soccer, and I was so happy to see him do something he truly enjoyed. He likes to run-alot on and off the field! LOL! He did so well. He even scored 3 goals! Too bad it was in the other teams net! He didnt even care he was jumping up and down waving his arms saying “YEAH! I SCORED! I WON! I’M AWESOME!” That was precious! I’m also proud of my husband for being such an involved father, and seeing his patience with the kids-that is a virtue I do NOT possess! They did pretty good following his directions and aside from going the wrong way a few times did awesome. The first clip is a video. Its of Noah’s kickoff-watch the kids try to follow directions! HILARIOUS! The boy who is suppose to stand over the ball kicks it, and in the end tackles it! Its like he decided to play football instead! Very precious! Here is Noah’s first game! Sorry some of the stuff is a bit fuzzy! I was far away. WARNING if you get motion sick-dont watch my video I took using our camera! OH BOY!